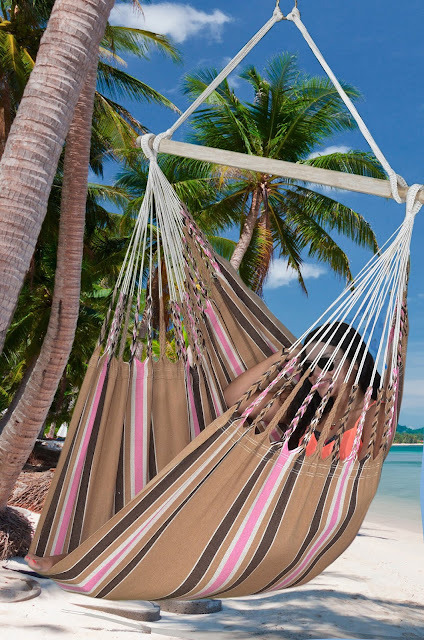 Some time spent in the HAMACA Cayo Hammock Chair is sure to lift your spirits, no matter what color you choose. This Colombian hanging chair is a soft and comfortable hideaway where you can relax and read, watch the clouds float by, or enjoy your favorite video. It is made from 100% recycled cotton which is comfortable, strong and good to the environment. Experience this hammock chairs incredibly cozy, closed-weave fabric indoors or out! HAMACA is our own hammock brand. You can be sure that our hammocks are made in a factory where we have full insight in how they are made and where we can be made sure that the staff is getting paid decent wages and treated well. Offer will only last until its sold out - when its gone its gone! Cayo is only available from our website and our dealers. Add an extra star to your holiday experience with a travel hammock! We at www.hammockheaven.co.uk think that the hammock is absolutely an essential to make the most out of your holiday and free time. Hammocks are so relaxing and de-stressing - still it is strange that most resorts dont have them available for their guests. They should! 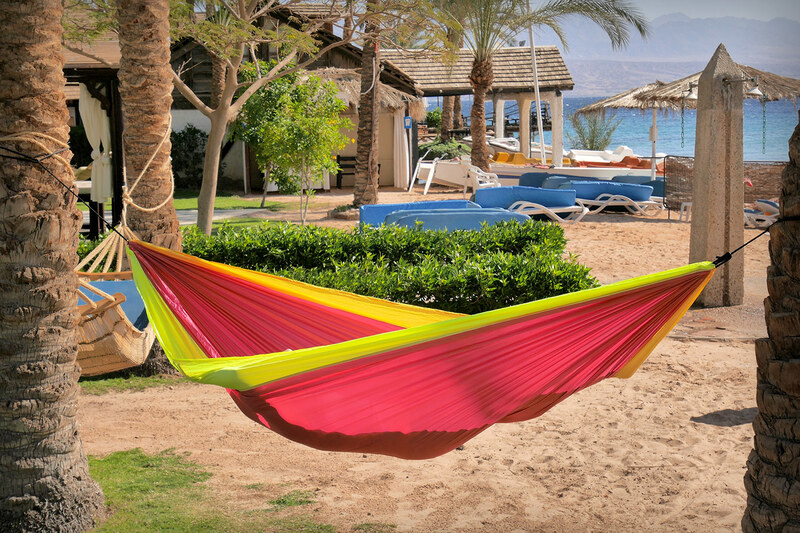 Our hammocks are usually bright and colourful which make also makes your environment more cheerful. So if you dont know if the resort has any hammocks or if they dont have you got to bring one. No worries - we have hammocks especially for this situation! This is the Travock rainbow travel hammock. It is new in our range.It is very large and comfortable for two adults and even extra children. It only weights about 700 grams so it is easy to bring with you whether you want to add an extra star to your five star holiday experience or to take with you on your backpacking holiday. Or just take with you on walks on sunny days where you live! Ropes and hooks are included so you dont need anything extra to hang it up between two trees (or poles). The Rainbow Travock Travel hammock is weatherproof and dries quickly when it gets wet. It is made of silk parachute material. It also feels soft on your skin and brightens up the surrounding environment with these happy rainbow colours. It is available to buy online for customers on www.hammockheaven.co.uk in the UK and on www.hamaca.se in Sweden. Hamaca is our own brand and our family business. Our hammocks are designed and made by us and only available through us. Do you want to sell our hammocks in your shop or webshop? Go to www.hamaca.co.uk for more info! Fight winter depression with the help of hammocks - they are not just for summer! Travel hammocks are great for a forest walk in the winter too! Are hammocks just to be enjoyed for warm summer days? Well, we at hammockheaven dont limit hammock use just to the summer season. As its UK and not the the most pleasant weather in the winter dont let it hold you back. There are those days where the sun comes through the clouds and when its for a moment almost feels like summer! Take your travel hammock with you for your walk in the sun and hang up when you want to relax and be in harmony with nature. This is a great way to combat winter depression! Best place to find discounts ! www.HammockHeaven.co.uk 2016. Simple theme. Powered by Blogger.